I’ve written before about being enamored with braided breads, and after making twisted loaves I thought it was time to add a wreath into the mix. 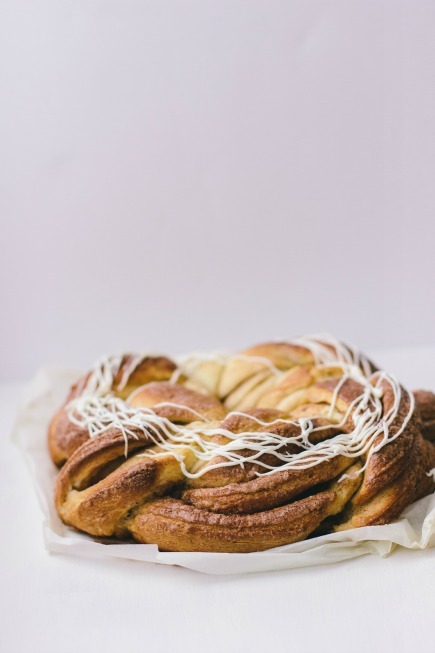 Seeing braided wreaths of bread all over Pinterest makes me immediately think of the Holidays, that holly jolly time of year when everyone turns a blind eye at eating too many delicious sweets. I have a special breakfast for Thanksgiving and my family always makes these cinnamon rolls for New Years Day, but Christmas Eve needed something special. 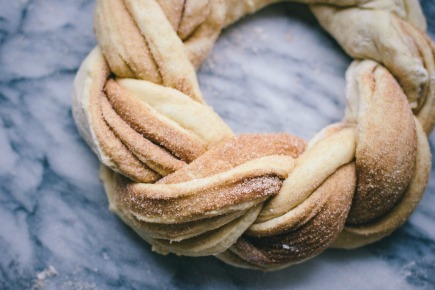 This wreath is the perfect treat. 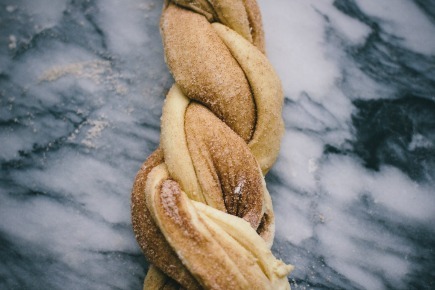 It looks harder than it is: just a few simple twists sprinkled with sugar and cinnamon make for a beautiful presentation. Click continue viewing below for more. But also: anyone posting a comment to this post will automatically be entered into a drawing–we’re giving away a copy of our any one of our U.S. books to five lucky winners (either The New Artisan Bread in 5, Healthy Bread in 5, Artisan Pizza and Flatbread in 5, or Gluten-Free Artisan Bread in 5). Contest closes and winners will be selected on December 19. Usual rules apply, (will only ship to a U.S. address, only one entry allowed, and must respond within 24 hours if you’re a winner). Contest is closed; winners have been chosen and notified in e-mail as of 12/19/14. Line a baking sheet with parchment. Roll out the dough into a 1/4-inch-thick rectangle. Brush with melted butter, and sprinkle with the cinnamon and sugar mixture. Starting with the long end of the dough, roll the dough into a log. Gently cut the roll into half lengthwise, so the layers of dough and filling are visible. With the cut sides facing up, gently press together one end of each half, and then lift the right half over the left half, and continue until you have braided the entire roll. Press the ends together. Form the log into a circle, and gently press the ends together. Place the wreath on the prepared baking sheet, and cover loosely with plastic wrap. Let the wreath rise for about an hour. Preheat the oven to 350F. After the wreath has risen for an hour, bake for 35-45 minutes, until the wreath is golden brown and cooked through. Top with icing if desired (this icing recipe from the cinnamon rolls is delicious). My kids love it when I make any thing with cinnamon and the brioche from ABIN5. This will be no exception. This looks amazing- can’t wait to try it! Thank you for finding ways to to nourish us GF folks with beautiful baked goods. I would love a copy of the Artisan bread in 5. Thanks for the post. It looks great. Looks like a perfect gift for my coworkers! Off to buy the ingredients! 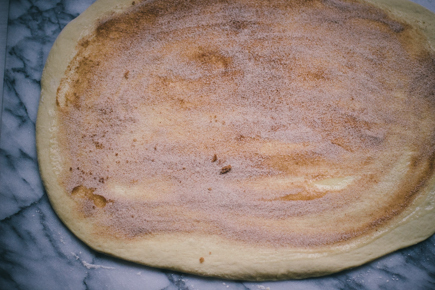 So beautiful, and cinnamon and sugar is such a heavenly combination. Happy holidays to both of you! I have all of your books except the gluten free one. Would love to win one for a friend who can’t have gluten. Looks like a great idea for Christmas! I haven’t been making as much bread lately but I’m thinking about trying some gluten free recipes. I have the first two books. Love them. It would be be great to get more recipes from one of the newer books. Thanks for continuing the series with new topics. My gluten free friends are excited,to try your recipes. Looking forward to trying this! 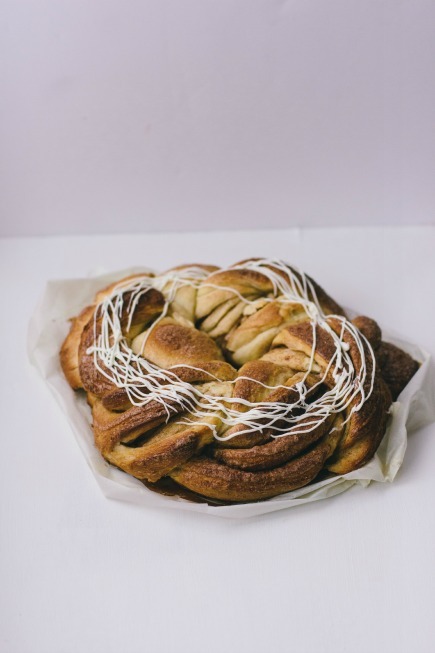 The look reminds me of a lot of the holiday breads made in Sweden: wreaths, braids, and other shapes. I always make the saffron buns for Santa Lucia. So thrilled to see cardamom in the recipe. I bought some in bulk and have been using it in lots of things. Can’t wait to try this recipe. I absolutely love your recipes and love your website! It’s so fantastic to read your blog and get inspiration to try new things! Thank you both! So beautiful! This might go on my breakfast list for Christmas morning. This looks so delicious! I can’t wait to try it. I love festive food! Where do you get all these wonderful ideas?! This is perfect for the holidays! Thank you! Love all things Artisan in 5! I can’t wait to try this recipe. I, too, get up early on Christmas mornings to make traditional cinnamon rolls for the kids to enjoy as they open their presents. This recipe sounds much better. 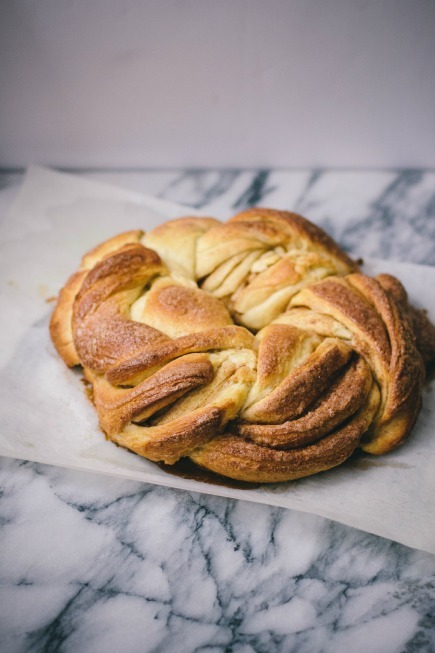 Have yet to try the brioche dough and this recipe is tempting me to mix up a batch. Will need to make a trip to the local library to check out New Artisan Bread in Five – again! This looks delicious! Artisan bread in five minutes a day has boosted my confidence as a baker. It is the gift I have most used this year! I look forward to adding other “Artisan bread in five” titles to my collection. i am making the caramel apple brioche cake tonight. I will try this next! A friend introduced me to your 5 minutes a day concept recently and it has given me hope that I might actually be able to do this myself. I’d love a copy of one of your books. Hi There! I’m new to this site and this technique/books, but this looks delicious. I just learned about 5 min a day from my sister, a fellow avid cook and member of my super cooking family. I make my own bread already, but I can’t wait to try this. I’d love to have a copy for myself — she is getting the GF version for Xmas! The 5 a day idea reminds me a bit of sourdough, since you keep a refrigerated starter around for your loaves. What size receptacle would I need for the refrigerated part of this method? I have a glazed ceramic crock with lid for sourdough starter, but it is not huge or 100% airtight. So glad you found our site, enjoy all the bread! Here is a post that will help you get started: http://artisanbreadinfive.com/2013/10/22/the-new-artisan-bread-in-five-minutes-a-day-is-launched-back-to-basics-updated The container needs to be about 5quarts. So beautiful! I want to try to make this for my Sunday morning coffee group! Thanks for posting a new ‘twist’ on an old favorite. It’s a nice, lighter offering than the caramel rolls. Beautiful! Another reason to mix up a batch of brioche dough. I can’t wait to try for Christmas eve! This is such a pretty wreath! What a smart idea to use a crock put:) I’ve got the first 2 books and would love to have the GF version! I see that, in addition to commenting on how enticing this wreath recipe looks, and thanking you for your good work, people seem to be explicitly saying that they hope to win a book, and say which book they hope to win. When I tell you why your work means so much to me, you will see that your method is uniquely beneficial in a way you probably didn’t imagine. An immediate family member has a lasting condition affecting the joints, making it too painful to stand up. I have been casting around for something he can do that is useful for the family while sitting down, and I think bread making using your method might be the thing. Together, we made a batch of your challah dough, and he was thrilled and proud to braid it into a gorgeous loaf for Rosh Hashonah. Yours is the only method that makes sense for people with joint problems, as kneading is too hard on upper limb joints. And, as you know, the ratio of great outcomes to physical effort is high. I’m drooling and will have to make this for the weekend!!! Is there a place where we can share the final products of our bake. Wow, this looks like a fabulous way to wake up Christmas morning! This bread is lovely, and looks delicious!!! Sorry if this question has already been asked; I did a search of the site and didn’t find an answer (and didn’t see any information in my AB5M book). I made a nondairy and eggless version of the Brioche (no eggs, vegan margarine, and honey) and baked it last night, so it’s cool. It came out lovely, but, the crust is very crispy. Normally, this would be a great thing, but, I need it to be a softer crust this time. Is there something I can do to soften the crust a bit? This looks delicious. 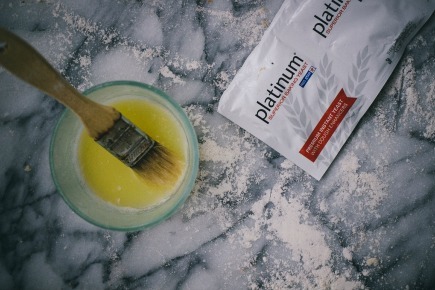 As someone who used to feel comfortable baking and then learned I had a gluten sensitivity (not to mention a long list of foods to avoid for an unrelated condition), I would really love to try “Gluten-Free Artisan Bread in 5.” I feel like I am learning to cook from the beginning again! The cardamom makes all the difference! 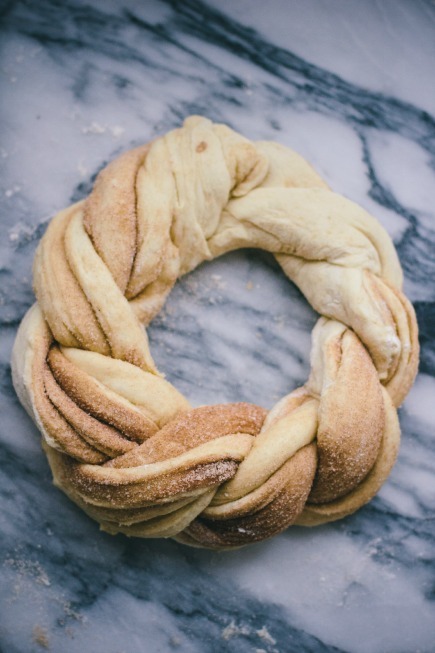 Really adds a great aroma to this wreath when baking. Thanks. This recipe looks delicious. Going to try it on the first snow day after Christmas. This looks like one very delicious bread. I’ve never made such a fancy shape. I think I’ll give it a try though. Thanks for the chance to win one of the books too! Have a lovely day! This looks lovely, not to mention delicious! So perfect for the holidays. Beautiful pics and great instruction. It’s now on my must do list for Christmas! What a studding wreath! And it looks delicious. Merry Christmas Zoe & Jeff! Your breads are now a consistent request from family and friends and I have tried to lessen the demand by giving your books as gifts! I made a batch of dough to bake 2 loaves & tho they baked up GORGEOUS I was surprised to find them still a bit doughy inside. Is this because they were too big? Also wondering if you can point me to one of your recipes that will be similar to a Hawaiian roll? I made the wreath and followed all directions and then put it in the fridge to bake it the next am. In the am I found my wreath on a puddle. I left it out to rise before baking and it would not rise. Any ideas how to fix for next time? Taste was good but sadly was flat. Next time I would make the log, but not cut and shape the wreath until you are ready to bake. The way this loaf if made, it naturally wants to spread out. I have lost my mind. Mixed up a batch of Brioche last night to try this recipe. When I poured the dough into the bucket, it was the consistency of cookie dough. What Had I done wrong. Then I say the water. I left out the water? Oh well, I dumped the water into the bucket, massaged the water into the dough until it was somewhat consistent and put the lid on. This morning when I got up it had doubled, so it went into the fridge. Will try the wreath tonight and see it I was able to save it. I have lost my mind! Thought you would enjoy all the different types of braided bread. I love this video, thanks for sharing! Those breads are incredible.